Show your customers the way to you – simply via app. This is achieved with just a few clicks. In this module you can store your address. You also have the option of adding another address and a description. You can also change the color of your pin. The map module of the app also offers a navigation function. 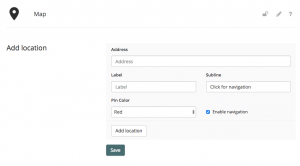 Simply add your address and check the navigation checkbox. This allows your app users to plan their route to you.